I love pizza. And really, who doesn’t? When I learned about Bistango I knew I had to check it out for myself. Bistango is an Italian restaurant in New York City best known for offering delicious and unique gluten-free pasta dishes and brick oven flatbreads that are both must-eats. As many of you know, I’m very cautious when recommending a gluten-free Italian restaurant – mainly because the risk of cross-contamination can be higher due to the ingredients traditionally used to make Italian dishes (e.g. flour, bread crumbs, etc.). The entire menu is already gluten-free with the only exception being the pasta dishes and two appetizers – mussels and the antipasto. However they can easily be swapped and prepared gluten-free in a dedicated area. 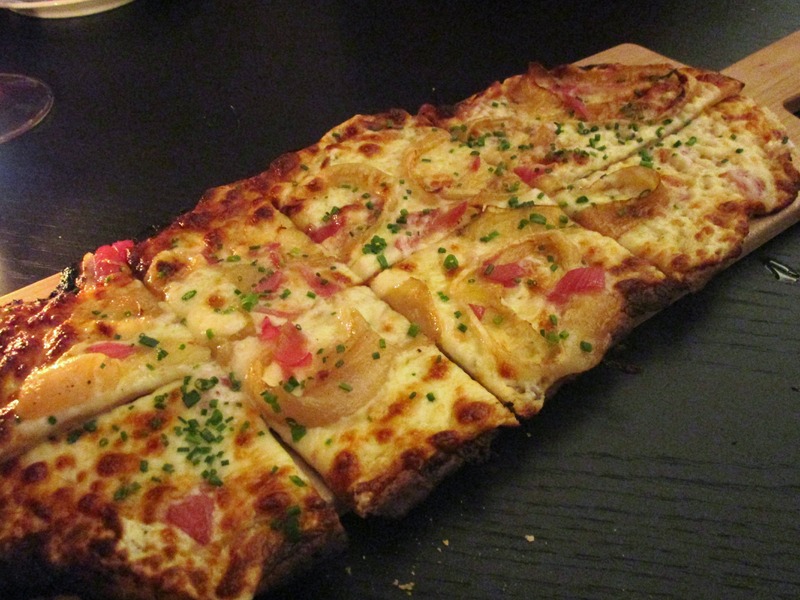 Bistango’s gluten-free flatbreads are a perfect way to start off your meal. Very thin and crunchy, they’re great for sharing or you can easily make it a meal on its own. Offering eight different options, the hardest decision you’ll face is deciding which to get. I chose the Cippolli because it wasn’t overcomplicated with a lot of toppings. I love the pairing of pickled and roasted Spanish onions. You might think with all that onion it might be overkill, but to the contrary. The onions offered very different but complementary tastes – tangy, vinegar bite from the pickled onions while the roasted Spanish onions brought out a delicate, lightly sweet, bite that was well received by yours truly. Love meat? Then this dish has your name on it. 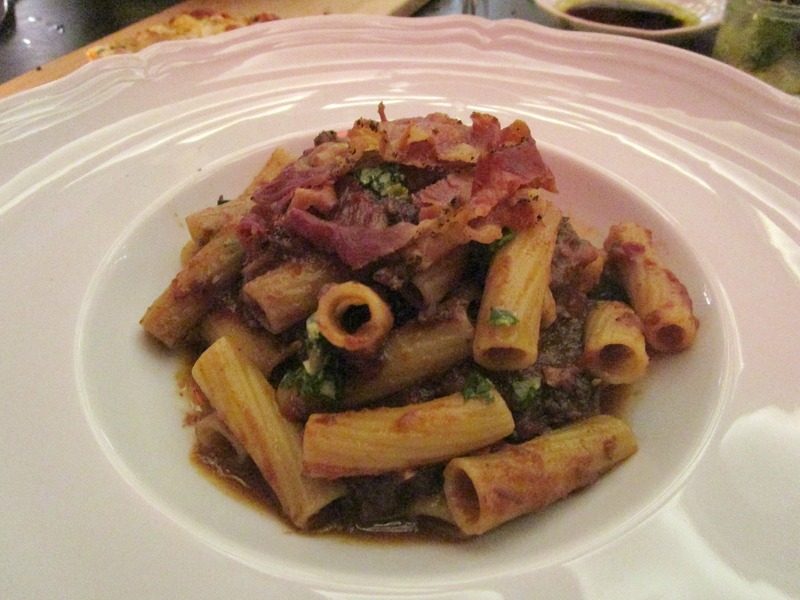 Chockfull of tender short rib meat and topped with crispy bacon, the Rigatoni dish is all things comfort and hearty. Surprisingly, this dish didn’t leave me feeling overly full. It’s not often that I get to eat gluten-free cavatelli pasta when dining out. So I’m very happy to report that the pasta was perfectly cooked and the texture was spot on. The dish was lightly coated in a cream sauce that was absolutely lucious. 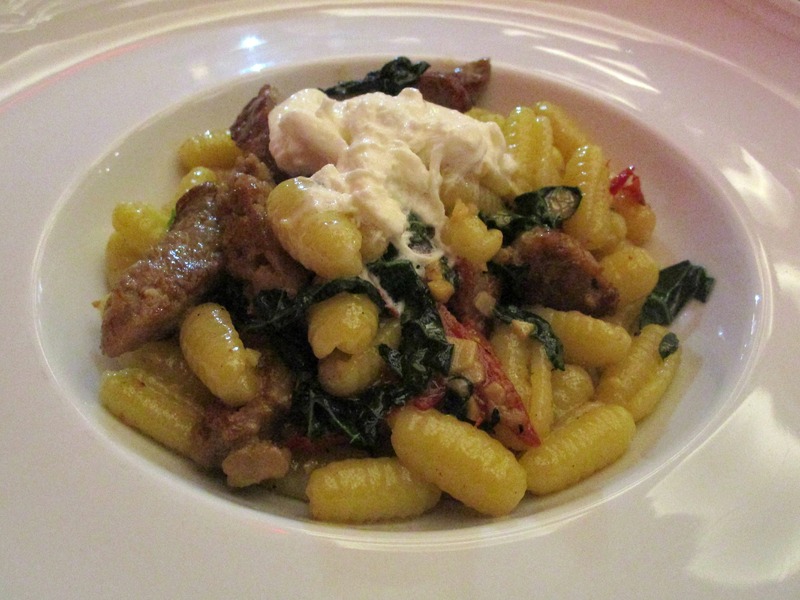 Slightly salty and savory, the sausage was a great addition to the dish. Out of the two pasta dishes, this was my favorite. Fun Fact: Bistango has two locations however the gluten-free menu is different at each. The second location is in Kip’s Bay and offers three different kinds of gluten-free stuffed pasta dishes and three different flatbreads. To check out the gluten-free menu at the Bistango Kip’s Bay location click, here.